A range of PCI (and Universal PCI) Multiport Serial Cards offering extra serial ports in either RS232, RS422 or RS485 format for simple connection of serial devices. The VXC-112U communication card provides 2 independent RS-232 serial ports. Each port offers speeds up to 115200 bps and can work in half-duplex or full-duplex communication modes. The VXC-112U is equipped with 16 bytes hardware FIFO. 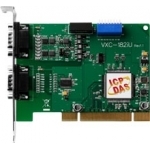 The VXC-114U card provides 4 RS-232 serial ports. It is equipped with 128 bytes hardware FIFO for each port, offering speeds up to 115200 bps and supporting full-duplex communication. The VXC-142i card provides two independent RS-422/RS-485 serial ports, with an isolation voltage up to 3 kV. The VXC-142i card provides two independent RS-422/RS-485 serial ports. Each port can be configured as either RS-485 for half-duplex or RS-422 for full-duplex communication. The VXC-144iU card provides 4-isolated RS-422/RS-485 serial ports which withstand isolation voltage up to 3 kV. The VXC-144U card provides 4 non-isolated RS-422/RS-485 serial ports. The VXC-182i serial card provides two communication ports, one is RS-422/485 and the other is RS-232 port. The RS-422/RS-485 serial port can withstand isolation voltage up to 3 kV.